Most of the people, while starting their adventure with a pet, get lost during the first shopping. It’s difficult to predict what is useful or necessary for our dog, and what can be only an additional pleasure. Collecting the basic starter kit for your dog is not complex, but it’s very important – because our new member of the family needs to know what belongs to him and learn the house rules. One of the most important elements of the dog starter kit is certainly a dog bed. Each dog must have his own corner at home. We should definitely make sure it’s convenient and well-suited to the size of our pooch. In this case we should use a professional dog bed. The sooner we show our pet where his place is, the less we risk of taking over our couch. The dog in his bed should also have some spare space, so that he can bring in his toys, stretch out and feel at ease. 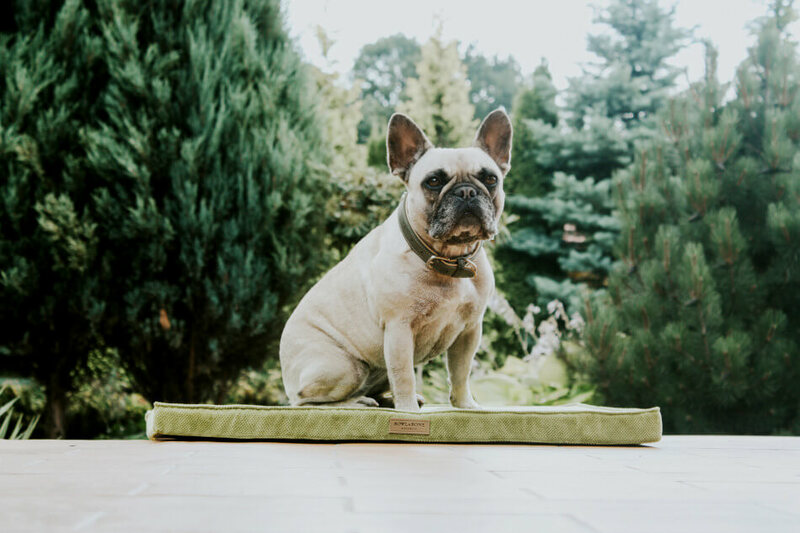 In addition, when buying a dog bed, we should pay close attention to the material from which it is made. 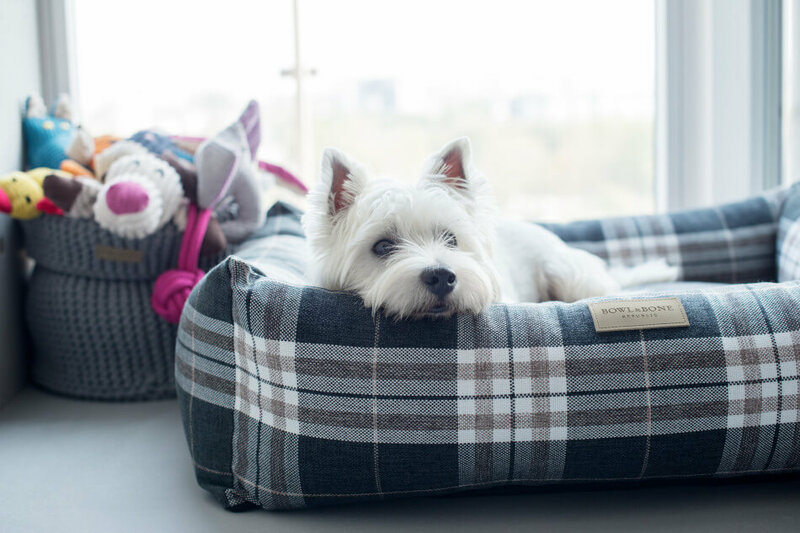 It should be safe, durable and easy to keep it clean, just like for instance the CLASSIC dog bed. A good idea will be a fold up dog bed with removable outer cover. This kind of accessories are easier for us to wash and clean –it’s important to remember that keeping them clean, apart from aesthetic values, is also very important for the health of our pet. The second important thing when collecting a dog starter kit is a dog bowl. Our new family member will need 2 bowls: one for food and the other for water. They should also suit to the size of the dog and the amount of food he eats. For a puppy, a bowl with a capacity of about 0.3l is enough, and for bigger dogs we can choose even the one with about 3l. 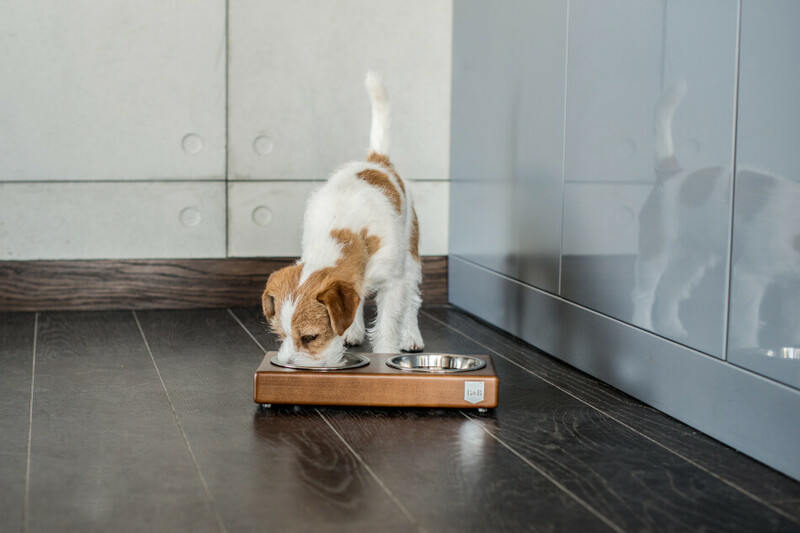 When choosing a dog bowls, we must pay special attention to their size, so that our pets can eat and drink without any restraint. In this case it’s a good idea to focus only on high quality products that will serve us for a long time. 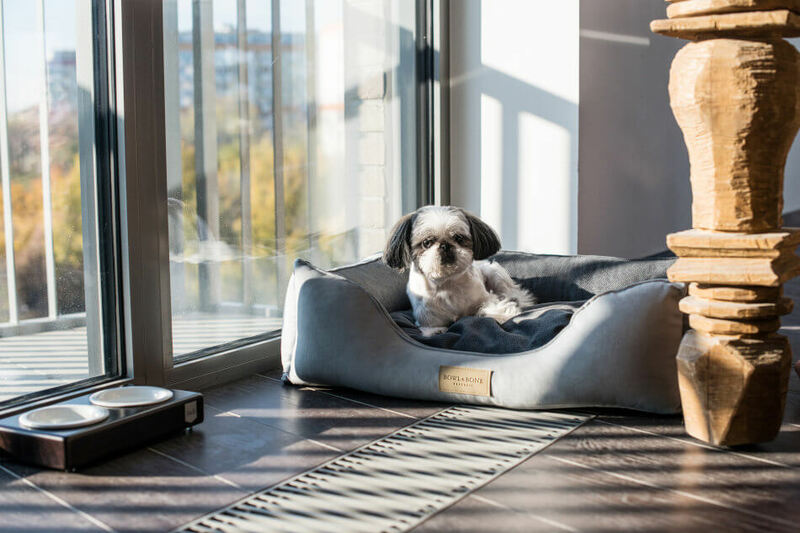 As the dog accessories are an important element of the interior design – it’s also crucial to choose the style of the dog bowl we like so that they match to the rest of the home furnishings. We should keep in mind that in our apartments dog bowls are often very visible, and they casually become a part of the room and our interior design. It is worth choosing to buy a dog bowl that is made of a good quality material, but also the one that looks aesthetically and blend in with the entire room. We should also take care that the bowl is stable so that the dog won’t be able to overturn or move it during meal time. The best choice will be the dog bowl with non-slip feet or a rubber base. An interesting idea for dogs with long ears, are special conical-shaped dog bowls that prevent the ears from getting dirty and makes eating and drinking easier. When taking your pet for a trip the best option will be a special dog travel bowl. It is easy to collapse and fit in any bag. The dog travel bowl is also easy to use, does not take up much space and will certainly provide comfort to your new best friend. A dog often needs to release some of that pent up energy. If you want to save your favorite pair of shoes, the best solution is to find for your dog a favorite toy. The second option is certainly more tempting? You should encourage dog to play from the very beginning, because it can have a very positive effect on his development. The senses of the pooch are stimulated by different colors, textures, sizes and hardness of his toys. There are also dedicated toys that works perfectly for most of the dogs such as the ones made of string. The rope dog toys can help to improve his dental health and get rid of itching gums. It’s very good when the toy is handy, so that the dog can easily grasp it with his teeth. However, we should pay the close attention to the size of the items we buy, because if the accessories are too small our pooch can swallow them, which can be very dangerous. When the toy is too big, on the other hand, it can bore your dog very quickly –he might have problems to catch or tug it. Many people choose to buy dog toys made of durable, high quality material, that are also very aesthetic –and that’s a good choice, because the pet accessories must be safe in the first place. Remember that the same kind of toy will not work the same for every dog. Some pets will like to play with balls and the other will prefer the tugger. You should try out several types of toys and observe which one will be the biggest fun for your pet. 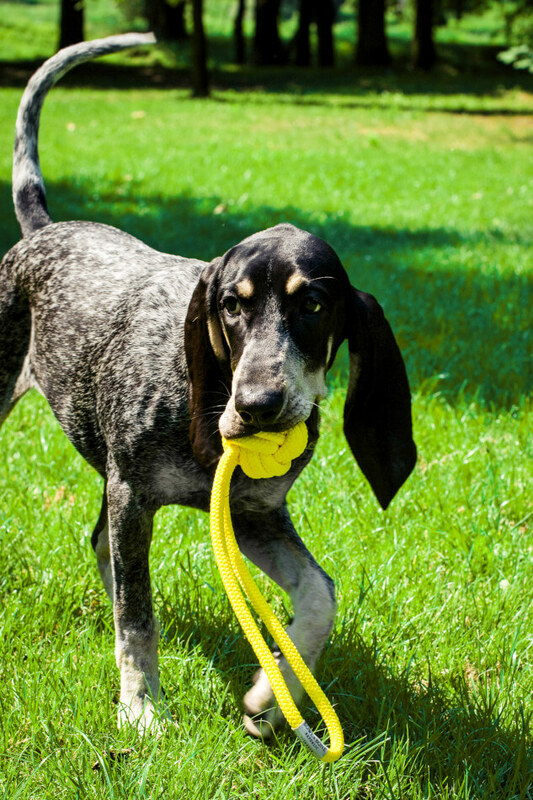 If we care about the proper development of our pooch, the perfect choice for the training time, for instance teaching him how to fetch, are the aforementioned rope dog toys. Throwing a toy and encouraging a dog to fetch is a great way to unload his energy. In addition, such play together, will strengthen the bond between the dog and his owner. Before your new pet arrives, you must also prepare some good quality food. The dog was previously fed with particular treats, so it’s a good idea to ask for more details. If we decide to change his food, we should do it step by step, slowly mixing and increasing the content of the new food in the diet of the new family member. When choosing the dog food, we should pay close attention to pick the one dedicated to our dog’s age and size. High quality ingredients are crucial when choosing the right food for our pet. Let’s not forget that before buying the new treats for your dog consulting a vet is a very smart decision to make. A lot of dogs can be allergic to various nutrients or simply have problems with the liver. There is much more things to check on your dog shopping list. However, it doesn’t mean, that we have to buy everything at once. It’s important to put quality and comfort of the dog in the first place.